This attractive member of the daisy familymakes a wonderful display in summer when it appears on roadside verges and banks, but do not be tempted to encourage this plant to grow in the garden: it is a tenacious weed that spreads and is very difficult to eradicate once it has got a hold. It may seem surprising that this flower, which is native to alpine regions of central and southern Europe and was introduced to Britain and Ireland in the early part of the seventeenth century as a garden plant, has become so widely naturalised. Fox and Cubs is a colourful perennial that spreads by seed and by means of stolons (runners) and shallow rhizomes. Plants usually grow to between 20 and 40cm in height, and the orange flowers are between 1 and 2.5cm in diameter. A key distinguishing feature (in addition to the orange colour of the flowers) is the presence of blackish hairs that cover the stems and, in particular, the young flower buds. At the base of each shallow-rooting plant is a rosette of hairy oval to lanceolate leaves from the centre of which the flower stem arises, bearing a tight cluster of up to 12 or occasionally more flowers on very short pedicels (stalks). Usually the flowers are bright orange, but sometimes they are a very pale orange, almost pure yellow. ; then identification is much more of a challenge. Most common in central and southern Britain but also recorded in Ireland, Fox-and-cubs is an introduced invasive species not only in temperate parts of Europe and Asia but also in Australia, New Zealand, Tasmania and North America. 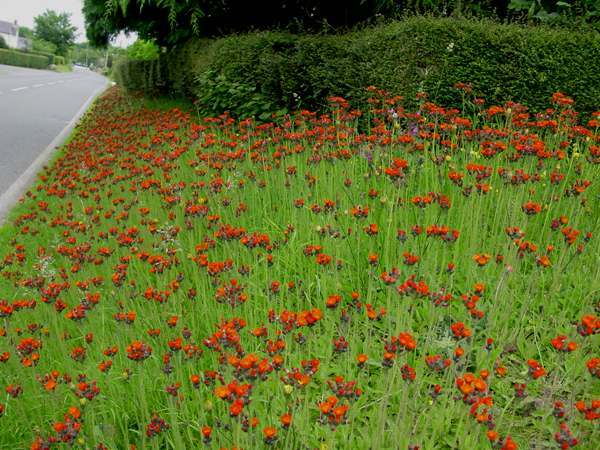 Often found on stony waste land, in churchyards on roadside embankments and beside railway tracks, despite efforts to eradicate it this fast-spreading wildflower has also become a permanent feature of many parks and gardens. In Britain and Ireland Fox-and-cubs produces its first flowers in June, providing a welcome burst of colour after many of our native wildflowers have died back. Flowering continues through summer and autumn, usually at least until October. Although lovely on roadside banks, this fast-spreading hawkweed can be a terribly difficult weed to control when it gets in to gardens. 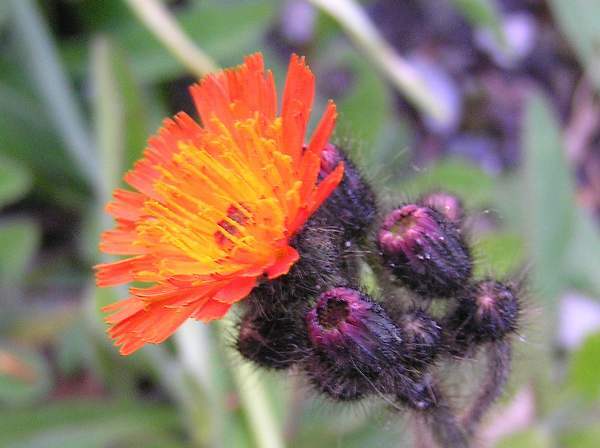 Pilosella, the generic name, means 'with small hairs', while the specific epithet aurantiaca means orange. 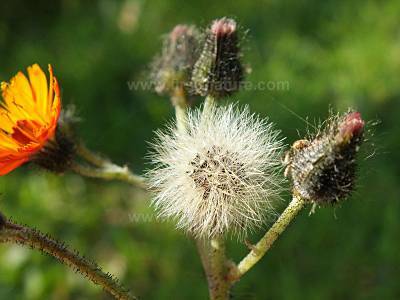 This is a hairy plant with orange flowers, so the scientific name Pilosella aurantiaca is perfectly descriptive. 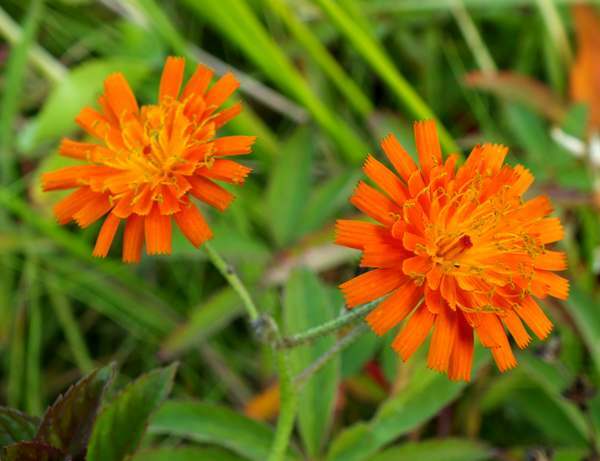 Fox and Cubs has many other common names including Tawny Hawkweed, Devil's Paintbrush Grim-the-collier (because the black hairs are reminiscent of a miner covered in colliery grime), and Orange Hawkbit. It is alleged that hawks eat these wildflowers and that this is the reason for their superb eyesight. In older field guides this plant may be listed under its synonymous scientific name Hieracium aurantiacum. Other members of the hawkweed group include Common Cat's-ear; there are also many hawkbits and hawksbeards, all of which havedandelion-like flowers. The individual species can often be distinguished by careful studyof the leaves. The plants shown on this page were photographed in West Wales during June, July and August.